The preferred drink of ballin’ rap artists, sociopathic businesspeople, and ennui-filled heiresses everywhere, Champagne is synonymous with luxury (and expensiveness). Despite the bubbly stuff’s cultural baggage, though, it’s perfectly possible to visit the beautiful region it comes from without breaking the bank. Here’s how. When people think of Champagne, they tend to think of the super-premium category: Krug, Dom Pérignon, Cristal, or the gold-encrusted Armand de Brignac (Jay Z’s choice of tipple), none of which can be found here in Australia for less than $200 per bottle (often significantly more). Alternatively, they might think of the major volume labels such as Moët et Chandon or Veuve Cliquot, which can be found for around $50–70 per bottle in Australia. Weirdly enough, prices aren’t that much more reasonable in Paris, itself a mere two hours or so by train from the Champagne region. But once you’re actually inside the Champagne region you can find some real treasures at bargain basement prices, with bottles of some truly wonderful drops from tiny Champagne houses you’ve never heard of to be found in the 10–15€ range. Many of these houses simply do not export their product, or even have national distribution deals to ship it to other parts of France, which means that if you pick up a bottle you’ll be bringing home something truly rare and unique. When you arrive in the Champagne region’s big towns – either Épernay or Reims – it’s easy to be seduced by the prospect of touring the cellars of one of the big names such as Moët et Chandon and Pol Roger (Épernay), or Veuve Cliquot and G.H. Mumm (Reims). These companies have illustrious headquarters with imposing, perfectly-manicured buildings and serious brand pedigree – all of which is reflected in the ticket price for one of their cellar tours. However, one of the region’s best cellar tours can be found in a Champagne house you’ve likely never heard of: Mercier. Mercier is an unusual house for a number of reasons: it started out as the region’s first growers’ cooperative; the founder, Eugène Mercier, started the business with the express intention of making Champagne accessible to the masses; and it became well-known through a number of clever publicity stunts such as building the world’s largest champagne barrel and opening a bar in a hot-air balloon. Perhaps unsurprisingly, the brand now leads sales within the French domestic market (which explains why it’s hard to find in Australia – most of it gets snapped up before it can leave France). Their cellar tour, which takes in the most extensive network of underground caves in Épernay, precisely reflects Mercier’s populist approach and unusual history: it’s a bit wacky and a bit naff, but also a hell of a lot of fun and much cheaper than the competition. The real beating heart of the Champagne region isn’t in the regional centres of Reims and Épernay – it’s in the innumerable tiny villages dotting the countryside. Not only are these villages as cute as buttons, they’re also packed to the gills with those tiny Champagne houses I mentioned earlier whose product can be picked up for a steal. If you hire a car from either Reims or Épernay (and make sure someone plays designated driver!) you can hit up a number of villages in a single day. 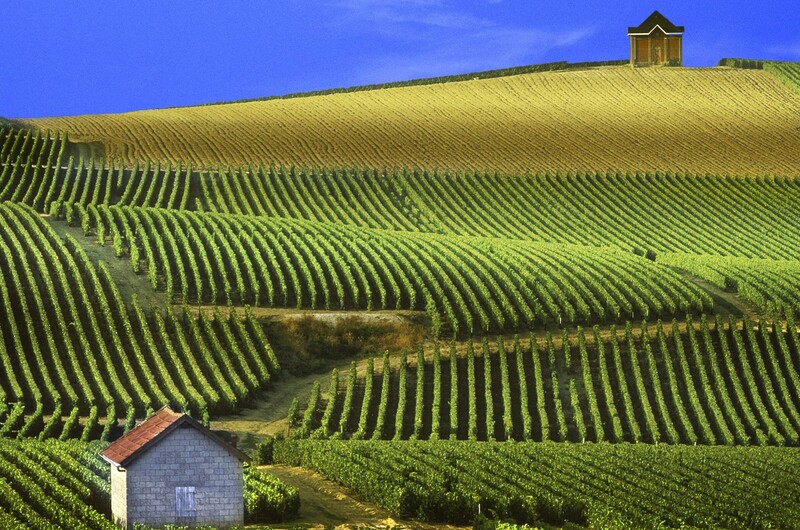 First and foremost among the region’s villages is Hautvillers, called the berceau (cradle) of Champagne because it is where the famous Benedictine monk Dom Pérignon lived, worked, and lies buried. It turns out that the claim that Pérignon invented Champagne is something of a myth – he actually tried his hardest to prevent the secondary fermentation that creates the bubbles in Champagne – but you should visit Hautvillers anyway because it is a gorgeous town with incredible views over the Marne valley. While there, drop into Champagne G. Tribaut to pick up a few bottles of stunning Champagne at a very reasonable price. If you’re a serious Champagne fanatic, drop into Le Mesnil-sur-Oger, home of two of the most exclusive vineyards in the world: Krug’s Clos du Mesnil and Salon’s Jardin de Salon. If you don’t want to drop more than a month’s rent on a bottle of bubbly, you can swing by Pascal Doquet in nearby Vertus to sample some wines from the Mesnil-sur-Oger subregion without the insane price tag. Essoyes is a little further out of the way, but is worth the drive: it was recently voted one of France’s prettiest villages, and Renoir was so charmed by it that he had a house there. A lot of the Champagne region’s tourism is structured for people with Champagne tastes and Champagne budgets – the hotels are mostly swanky as all get-out. But don’t despair if you can’t afford to drop a few hundred euros per night to stay at Les Crayères: you can still find a place to stay cheaply. Reims and Épernay are more than tourist destinations, they’re also home to thousands of regular French workers who pick the grapes, make the wine, and clean the cellars. Some of those people have spare rooms they rent out through Airbnb for additional income, and as long as you have a little conversational French under your belt (because English isn’t as widely spoken here as it is in Paris) you’ll be made more than welcome. Similarly, many of the restaurants around the area are targeted at the well-heeled, so when you need to line your stomach before another afternoon of sipping fizzy wine, consider picking up a fresh baguette from the nearest bakery, a wheel of ripe cheese from the nearest fromagerie, and some seasonal fruit and vegetables from the market. This kind of fresh food is seriously cheap in France, as well as remarkably delicious, and you’ll save enough money by self-catering to pick up an extra bottle or two of the good stuff. Santé! Check out Qantas flights to France here.